"Those who cannot remember the past are doomed to repeat it"
Welcome to In Their Shoes Dachau Memorial Tours and City Tours. We are a small tour company specializing in educational tours of the Dachau Memorial and the city of Munich . 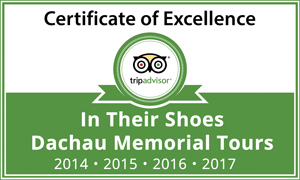 Since 2011 James and his small team of expert, experienced, and authorised guides have been educating visitors not only of the horrors of Dachau and the concentration camp system during Adolph Hitlers Third Reich but also the history of this horrific time in history in general. The Dachau Memorial is one of the most well preserved camps in all of Europe. Join us on one of our small personable tours and find out why thousands of guests have left satisfied over the years. March 1933, not long after Adolf Hitler came to power, the first permanent Concentration Camp of the Third Reich opened near the township of Dachau, a town NW of Munich. Over the next 12 years more than 200 000 people were incarcerated in Dachau, which became synonymous with the suffering, oppression, misery and death under the brutal watch of Heinrich Himmler's SS. Dachau was known as the "school of terror", the training grounds for future commandants of the ever expanding concentration camp system and became the model for all other camps throughout the German-occupied territories, resulting in the death and suffering of countless innocent victims at the hands of the tyrannical Nazi regime. Our tours offer an expert and well researched insight not only in to the horrors of Dachau, we will give a very detailed history lesson of the rise of Nazism in Germany as well as a lesson of the Concentration Camp System in General that ultimately led to the Extermination Camps and the Holocaust. This authorized tour of the Dachau Memorial Site traces the history of the former concentration camp and offers insight into the reasons behind the injustices as well as the circumstances under which the inmates suffered. Even though Dachau and Europe was liberated 73 years ago we believe it is still extremely important to take the time to visit a former concentration camp during your travels if given an opportunity.